This seems to be a well discussed error, but I've not been able to resolve it. 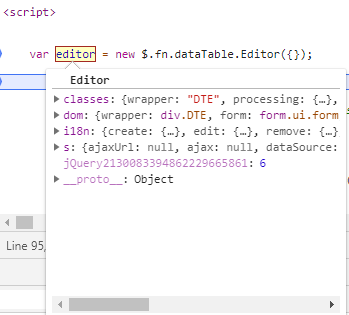 "$.fn.datatable.editor is not a constructor"
I have these references to js and css. You haven't shown your references to js. You only listed CSS includes. Are you including dataTables.editor.js? Plus you are loading CSS files for many different styling libraries (bootstrap, jqueryui, ec). Which are you using? You only want to load for that one library. You can try the Download Builder to help get the correct JS and CSS include files for Datatables and Editor. Apologies, the js was excluded from my post. They're there now that I've removed the < and >. I'll reduce the css references, thanks for the advice. A reference to jQuery js should precede your other js references. The same goes for the JS references. The Editor is loaded locally on your server. Make sure the paths are correct and the at files are being loaed. There are no errors when running the code in the attached screenshot. So is the initialisation described in this article no longer supported? Maybe the order you are loading the scripts in your page? ITs hard to say whats going on in your page without seeing it in action. Can you post a link to your page or a test case showing the issue? I've now gone an alternative route with my code, so I'm past the initial error. However, I am now receiving this (also well documented error). Based on the points in the article, I've played around with the fields defined for my datatable and editor but with no success. Is anyone able to suggest what the correct field setup would be for the Editor based on what I have in the DataTable fields? I've uploaded a test case, it's showing the initial error that I was getting though. Any input would be great, thanks. I have found for inline editing to work each row needs filed with a unique ID. not sure you have one with the data you have so e I added one. I used idSrc in the Editor config to map to the ID column. Now inline editing works. Thanks so much for this Kevin, it's a massive help. Thank you for your time.